A selection of the best bars and nightlife in Danang. As Danang establishes itself as a major tourism and commercial centre, a bar and club scene is emerging. Hoi An to the south is good for a quiet drink. Danang offers more boisterous nightlife options. There’s a flourishing local scene as well as a handful of bars catering to expats and travellers. The main expat bars are around the Bach Dang St area and then in a small enclave known as My An. Here are our recommendations. Waterfront is a popular eatery and drinkery on the Bach Dang riverfront. Good for a gastro pub-style bite and an international vibe. Waterfront also hosts regular live music and DJs. Fatfish is a restaurant but the bar downstairs is a cool spot for a quiet glass of wine or a cocktail. And if you like the feel, hang around for some tasty contemporary Asian cuisine from chef Tran Duc and his team. 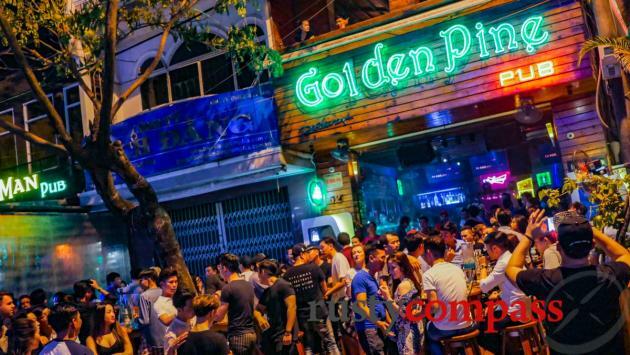 If the night gets messy, Golden Pine, also on the river along Bach Dang St, is a rowdy spot with big crowds of young locals as well as tourists and expats. It’s open till late, there’s a DJ most nights, the music’s loud, the crowds spill over onto the street and it’s busy most nights. Address: Golden Pine 52 Bach Dang Street Danang. Danang is getting in on the skybar concept that’s booming in Saigon. 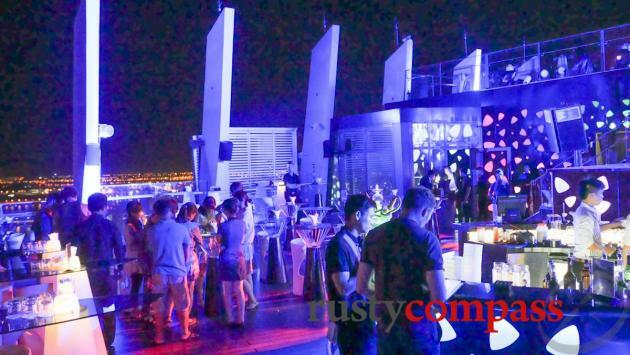 Sky36, which is on top of the Novotel Hotel touts itself as Vietnam’s tallest skybar. It attracts a more dressed up crowd of locals, expats and travellers. New Phuong Dong nightclub is Danang’s largest nightclub. It mightn’t be very new but it’s enormous and its popularity endures. The dance floor takes pole dancing to new heights with poles that run from floor to ceiling and dancers pulling off impressive gymnastic manoeuvres from on high. The DJ plays loud pop dance tracks and the atmosphere’s more festive and friendly than similar clubs in Saigon and Hanoi. A very Vietnamese take on clubbing. Open till 3AM. Exquisitely cheesy, Seventeen Saloon is a great stop for a large session around Danang’s bars. The Filipino bands pump out familiar rock hits. Like the playlist, the crowd spans the decades. Not a spot for a quiet drink. Seventeen Saloon is located slightly away from the other places listed here, in Son Tra District. It’s about 10 minutes away by cab. Big sports and live music venue - popular with expats. We’ve seen some good live acts on the stage here on weekends. Dirty Fingers is Australian owned and the selection of sports on the big screen reflects that. A friendly pub-style stop for a beer and a bite with live tunes and more on weekends. There are a bunch of friendly stripped back drinkeries in Danang’s main expat precinct. They seem to have been created to serve the sizeable and thirsty expat English teacher community. They’re all laid-back little venues for a chat over a beer and simple bites. Wander along Ngo Thy Sy St and pop in for a look at Minsk Bar, Heaven, Filling Station or just off Ngo Thy Sy is Crazy Catz on An Thuong 6. 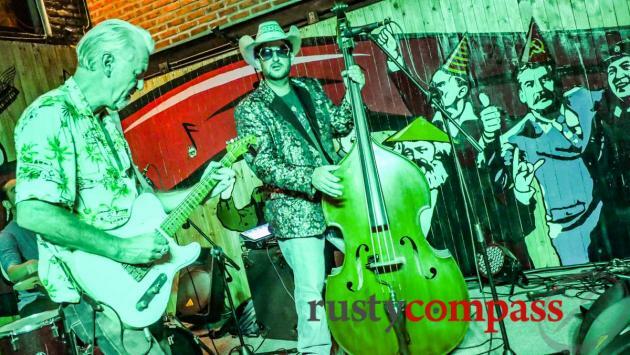 You’ll find a mix of live tunes and mainly young sociable expats hanging out over reasonably priced drinks in bars that remind me of Saigon in the 90s. Rusty Compass recommendations are always independent. We list the places we think you should know about and that’s it. No money changes hands for a listing and we paid our way at the places listed here. We know the owners of Waterfront and Fatfish and may have had an occasional drink on the house at these bars.